Patio Cover Types - L.J. Hausner Construction Co.
Lattice patio covers provide a beautiful place to rest and relax, have family gatherings or simply enjoy the outdoors while reading the newspaper and having your morning coffee. The lattice patio covers are architectural in design and provide wonderful ventilation to allow fresh air to flow through the area. Hausner Construction can design a custom patio structure that will complement your home and your personal style. Lattice patio covers are a great and affordable way to turn a hot, sunny patio into a welcoming retreat. 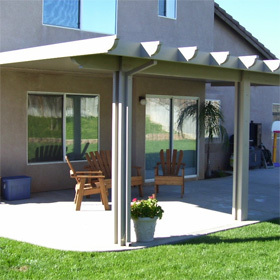 Our flat pan patio covers are ideal for Southern California homeowners who are looking for complete protection from all the elements. 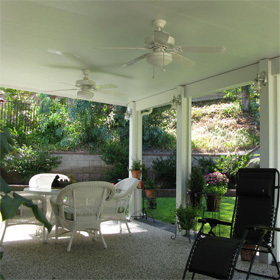 Flat pan patio covers are great for providing a shaded area to relax and enjoy the outdoors in. Flat pan patio covers are also great if you want to screen in your patio or porch area. The flat pan aluminum patio cover will attach to your home’s roof or wall, making it easy to install a screen to prevent small insects from getting into your patio area. Enjoy more of your outdoor space with a flat pan patio cover! Insulated patio covers offer that added protection from the elements with an insulation value, higher than most wood framed patio covers. They are perfect for homeowners who may want to enclose at a later time with our insulated wall system to create an extra living space, enjoyable for year round use. All our patio covers come with a transferable lifetime warranty against fading, chipping, peeling, and are maintenance free, allowing you to sit back and enjoy. Call us today or complete our free in-home consultation form online to speak with our patio cover design experts.